There is something I neglected to cover in a previous blog post, Building an OS X App With RubyMotion. Once you’ve written the OS X app, where do you find the executable, and how do you add it to the Applications folder on the Mac? Long-time Mac enthusiasts may already know how to do this. The information is included here for completeness. First thing to note: A Mac app named [random-app].app is actually a directory, even though it appears to be a file when viewed in the Applications folder. If you’re curious, right-click on any app in the Applications folder and choose Show Package Contents from the speed menu. After compilation, RubyMotion puts all of the executables in the app’s build/ directory. 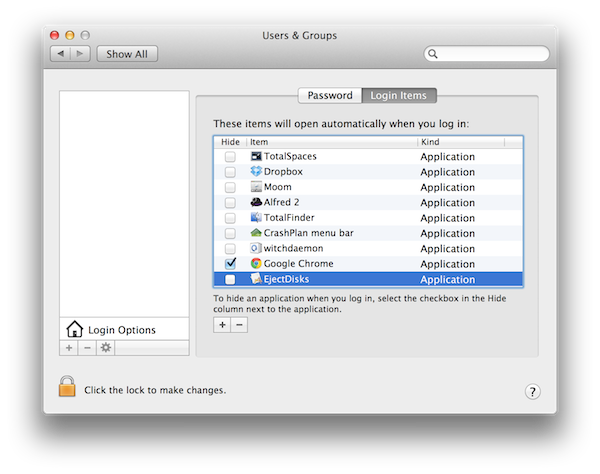 Using Finder, drag the folder named [your-app-name].app into the Applications folder. It doesn’t really matter whether we copy the file or move it. RubyMotion creates a new one with every build, when we type rake. 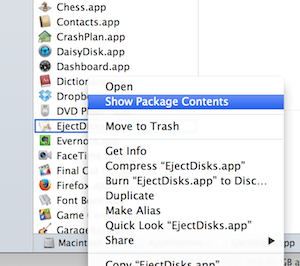 Click the + sign, navigate to the app you want to launch at login time (in this case, EjectDisks) and select it. Done.